All of the Inspirational Spots. . . .
A blessed 2006 to you. We begin this new year with a prayer. May Our Almighty Father smile upon you and those you love. May He bring you peace of heart, the strength to endure what you are asked to endure, the joy of knowing that He is always near. May He especially bless you abundantly for your kindness to the remote villagers whom our mission serves. INTENT: (left) KNOM general manager Ric Schmidt is hard at work in his office. From Albany, Oregon, Ric is a 21-year veteran of Catholic radio. He’s a graduate of the University of Oregon. 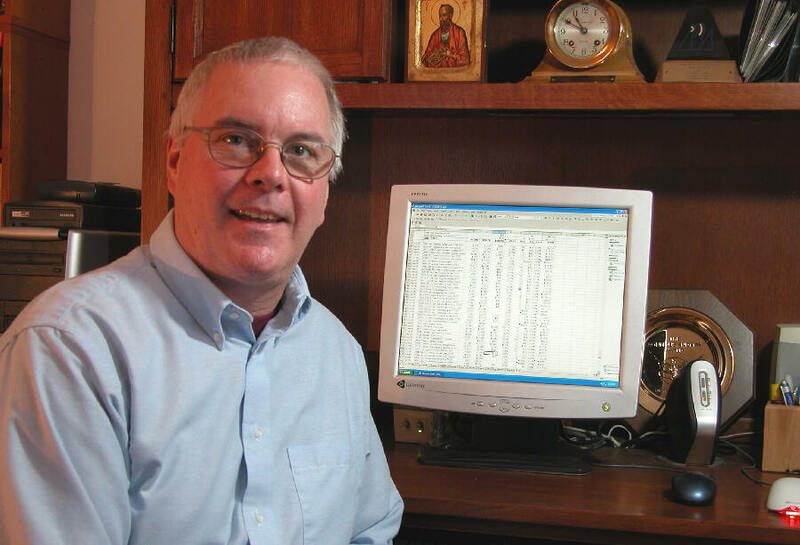 After a volunteer year at KNOM in 1984, Ric was asked to be founding general manager of Catholic station KBVM-FM in Portland, Oregon. He returned to KNOM as program director in 1995, and was elevated to general manager in April 2005. You won’t often find Ric idle. He’s vice chair of Alaska’s Employer Support of the Guard and Reserve, longtime treasurer of Nome’s Rotary Club, for which he is a past president, and for the second year in a row, was elected president of the Alaska Broadcasters Association. THE VERDICT: For nearly two months, news director Paul Korchin spent weekdays in Kotzebue, 180 miles north of Nome, spelled briefly by Amy Flaherty. The reason was a re-trial of a former Nome police officer for the murder of a 19-year-old woman. The trial was potentially explosive, as he is Caucasian, she was Yup’ik Eskimo. Paul’s detailed, balanced and thoughtful coverage drew praise from all sides. This dramatic moment was the first time we’ve provided such live coverage – or felt we needed to. The oldest Catholic radio station in the United States, KNOM beams inspiration and education into thousands of isolated western Alaska homes 24 hours a day, thanks to you. KNOM “EAST” (left) In Anchorage, 539 miles from Nome, Tom Busch works as KNOM’s financial officer and development director. Tom was founding engineer for the station in 1970. He served as general manager for thirty years before stepping down in April 2005 to concentrate on finding new contributors for the mission. FALLEN STAR: Last month, we reported to you that the KNOM Christmas star would be dark this year, for the first time in thirty years. We were wrong. The 5-foot lighted star is mounted on top of KNOM’s 80-foot microwave tower at the studio, in the heart of Nome. In September, it was severely damaged, hit by flying debris during a hurricane-force windstorm. It looked so terrible that we figured we’d have to wait until next May or June, when a tower crew will be in Nome for scheduled maintenance on our main tower. In mid-December, some folks mentioned that it just didn’t seem like Christmas without it. And so, volunteers Liz Recchia and Eric Guthier flipped the star’s power switch, just to see what would happen. Dear Lord, whose Voice I hear in the wind, and whose Breath gives life to all the world, I pray to You. Let me walk in beauty, and help my eyes behold the red and purple sunset. Make my hands respect the things You have made, and my ears sharp to hear Your Voice. Make me wise so that I may understand the things You have taught us. Let me learn the lessons You have hidden in every leaf and rock. I seek strength, Lord, not to be greater than my neighbor, but rather to be open to the challenge of Your Beauty. DECKING THE HALL (left): KNOM program director Kelly Brabec was “woodsman” this year, sawing this willow shrub and decorating it in the KNOM front office. The willow was one of several growing wild behind the station’s storage shed. From Fremont, Nebraska, Kelly first came to KNOM as a volunteer in 1998. She has worked in a variety of roles, and today supervises all of KNOM’s non-news programming. 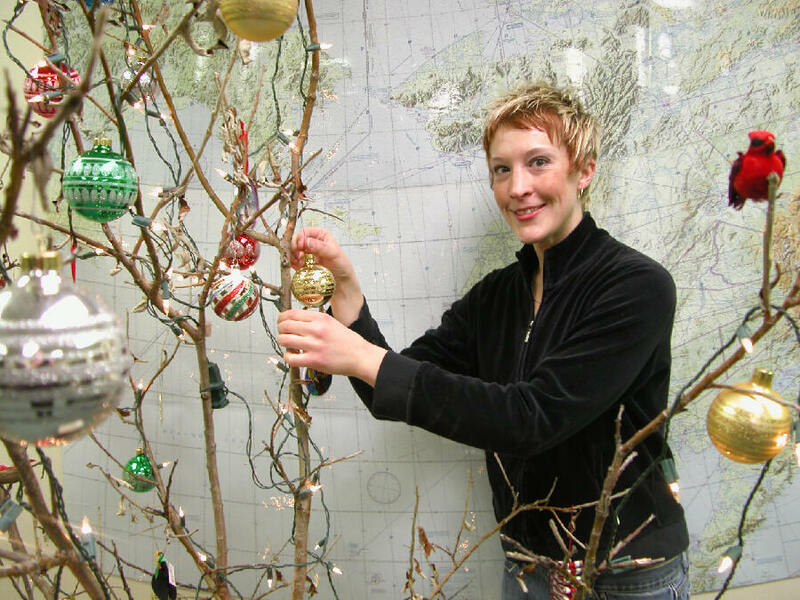 Behind Kelly is a nearly floor-to-ceiling map of Alaska, actually a combination of Federal Aviation Administration charts, that KNOM’ers have found extremely helpful over the years. POVERTY: According to a two-part story written by KNOM news volunteer Jesse Zink in December, the Yukon River Delta is among the poorest regions in the United States. Nearly one out of three children live in poverty. It’s the heart of KNOM’s coverage area. Twelve years ago, the U.S. Census Bureau’s figures had nearly half the region’s kids in poverty. Why the apparent improvement? Jesse reported it was due to an increase in average annual household income of less than a thousand dollars, just enough to bump many families out of “official” poverty. WE REPEAT OUR PLEDGE TO YOU: We respect your privacy, and repeat a promise which we have consistently made since 1966. We will never, for any reason, provide your name or address to anyone. Thank you very much for making our important work possible. May God bless you with anger at injustice, oppression and exploitation of people, so that you will work for justice, equity and peace. And may God bless you with the foolishness to think that you can make a difference in the world, so you will do the things which others say cannot be done. INSPIRATIONAL SPOT: God will always find you. No matter what problem you’re facing, or how far you think you’ve drifted away, God will find you. Take a minute each day to acknowledge the Lord’s presence. 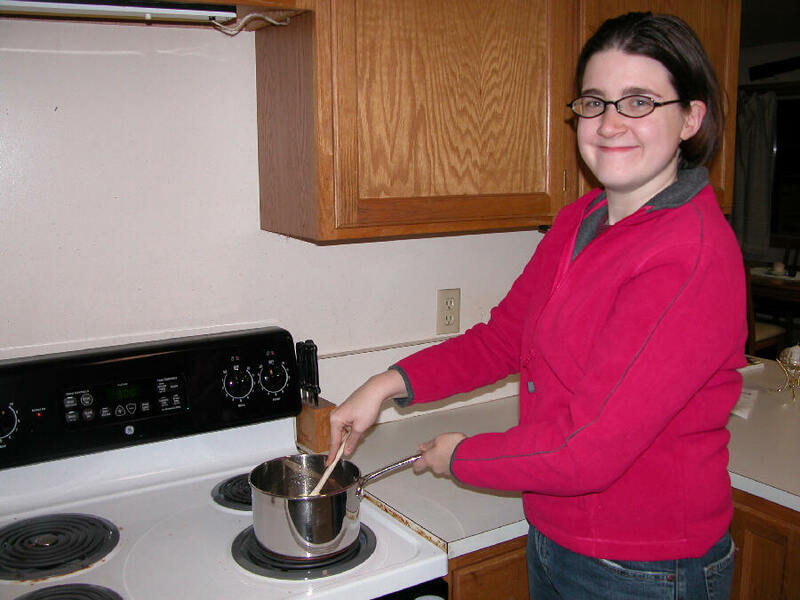 ON THE FRONT BURNER (left) KNOM volunteer music director Liz Recchia puts the volunteer house’s brand new stove to work. Thank you very much to everyone who so generously contributed to provide this stove, as well as the kitchen and dining area’s vinyl floor, which has seen plenty of hard use over the past thirteen years. COST CONSCIOUS: In the most recent survey by the University of Alaska, Nome’s food prices were found to be 201% those of Portland, Oregon. That’s up, due the increased cost of transporting food by barge or by air. Last year at this time, they were “only” 191% Portland’s. In the villages we serve, costs are even higher, 250% to 300% living costs in Portland. THIRTY YEARS AGO: January 1976, KNOM began airing “Word of the Day,” a daily Rosetta stone, featuring one word in the English, Inupiat, Yup’ik and Siberign Yupik languages. The series was developed with the encouragement of Nome’s new Northwest Community College. That month, KNOM reported that over the past year, Nome police arrested 15% of the town’s juveniles, principally on alcohol-related offenses. The report further cited the shocking results of a survey: 20% of Nome’s grade school children admitted to regularly using both alcohol and tobacco. 34,000: That’s how many inspirational spots KNOM broadcasts every year. That’s also how many educational spots we air. You will also hear the Mass and the Rosary, plus hours of news, weather, the discussion of vital issues, community information, positive entertainment and companionship. KNOM appeals to an immense audience, most of whom would never listen to conventional religious radio. While one or two other stations can be heard in every village, KNOM’s listenership varies from 75% to 100%. We truly cannot thank you enough. As we reported to you last month, 96.7% of our operating income is individual gifts by good people like you. May God bless you greatly, through this new year and always!